Smith hopped on stage during “Hottie” to show off some dance moves. Brockhampton has had a wildly prolific year, producing three albums with visuals and cementing their place as America’s new boy band. In 2018 the group is kicking off its Love Your Parents tour, but before then the crew is performing several shows in Los Angeles. During a show last night at the El Rey Theater, the band was joined by a very special surprise guest: Jaden Smith. Smith took to the stage to perform “Hottie,” while showing off his iconic dance moves. 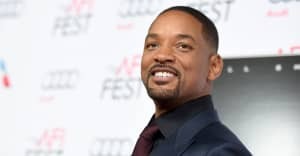 Smith is a friend of the group and has promoted its music throughout the year, hinting that they had some possible collaborations coming in the near future. Earlier this month Brockhampton released Saturation III, while Smith dropped his 17-track, debut album Syre in November. Check out footage from the surprise performance below. Check out Brockhampton's upcoming tour dates below.